The games industry isn't 100% digital just yet, but digital revenues are growing in a hurry. Research firm Superdata today released its monthly worldwide digital revenue figures, showing that people spent $8.5 billion digitally on games for the month of October, a 15% jump year-over-year. Much of that growth was driven by the premium PC market, which had two high-profile success stories during the month. 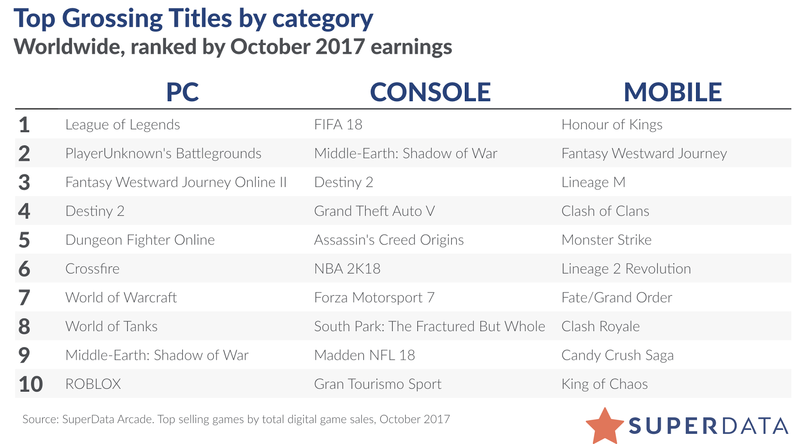 Destiny 2 followed up the largest digital console launch ever with a successful debut on the PC, while PlayerUnknown's Battlegrounds had its best month yet, selling another 5 million copies. Given recent debate over the potential of single-player games in today's market, Superdata said October was a successful month for a number of single-player-focused titles. South Park: The Fractured But Whole, Middle-earth: Shadow of War, and Assassin's Creed: Origins combined to bring in more than $160 million in digital revenues, while Super Mario Odyssey gave the Switch its biggest digital launch to date, selling 191,000 copies. That number may seem low for a game as well-received as Super Mario Odyssey, but Superdata noted that digital full-game purchases on Switch still lag behind those of the Xbox One and PlayStation 4. Despite the results, Superdata was clear that it views single-player games as disadvantaged when it comes to long-term potential. "We don't expect these games to have as much success in the long run, compared to the multiplayer genres, as it is generally harder to monetize through microtransactions in a single-player focused title," the firm said.